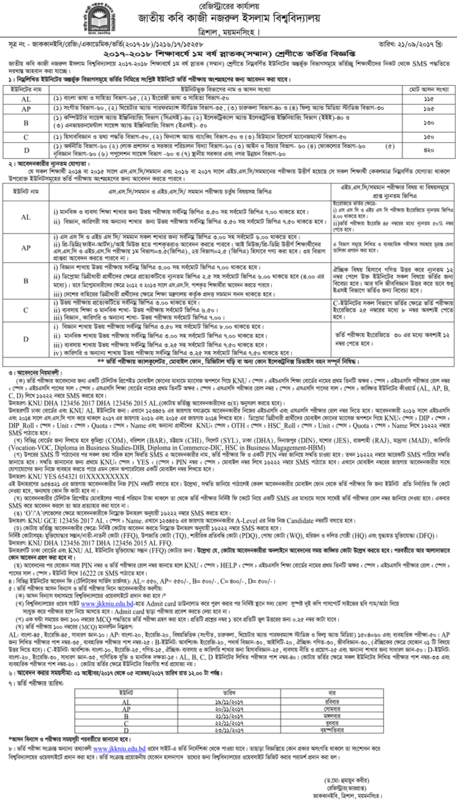 Jatiya Kabi Kazi Nazrul Islam University Admission Circular 2018-19. JKKNIU Admission Result 2018-19. JKKNIU Admission Question Solution, Seat Plan & Admit Card 2018-19 Published. The JKKNIU authority published 2018-19 academic session notice on their official website – jkkniu.edu.bd. Every year the university authority start their new academic session depend on HSC results. According to HSC result and GPA percent, they published their circular. The university have 5 unit – KA KHa GA GHA UMA. This year it will as usual like previous year. But in this post we will show show all information about JKKNIU admission 2018-19. Jatiya Kabi Kazi Nazrul Islam University is a government financed public university of Bangladesh. It is also known as JKKNIU. It named to our national poet Kazi Nazrul islam. There are nineteen departments under four faculties. There are two students hall in Jatiya Kabi Kazi Nazrul Islam University- Agnibeena and Dolonchapa. All that it is a nice university. Now, it is a question that, how to apply in JKKNIU. Don’t worry, in this post we will update every single information. So stay on us and like our Facebook Fan Page. JKKNIU authority published 2018-19 academic session. After publication circular we updated all information here. So visit our website everyday to get updates. Interested applicant has to completed HSC/Equivalent exam in 2017 or 2018. Candidate must passed SSC/Equivalent exam in 2015 or 2016. Applicant must get minimum CGPA 3.00 (out of CGPA 5.00) in SSC and HSC exam separately. They have to obtain total at least CGPA 6.50 both of SSC and HSC exam. KNU <space>HSC Board Name<space>HSC Roll No<space>HSC Passed Year<space>SSC Board Name<space>SSC Roll No<space>SSC Passed Year<space>Your Desired Unit<space>Quota And send to 16222. Example: KNU DHA 123456 2018 DHA 436374 2016 A and Send To 16222. For Quota: KNU DHA 123456 2018 DHA 536236 2016 A FFQ And Send To 16222. Candidates have to Download JKKNIU Admission Test Admit Card by official website. JKKNIU Admit Card download date and time schedule will notify by SMS and official site. You can download JKKNIU Admit Card by using Application ID and Transaction ID. Visit http://jkkniu.edu.bd/admission.php and Click Admit Card Menu. Download your JKKNIU Admit Card and Print It. Kabi Nazrul Islam University admission Test Seat Plan Will Publish 3/4 Days Before of Admission test. When The Authority Publish Jatiya Kabi Kazi Nazrul Islam University Admission Test Seat Plan, We Update Here.